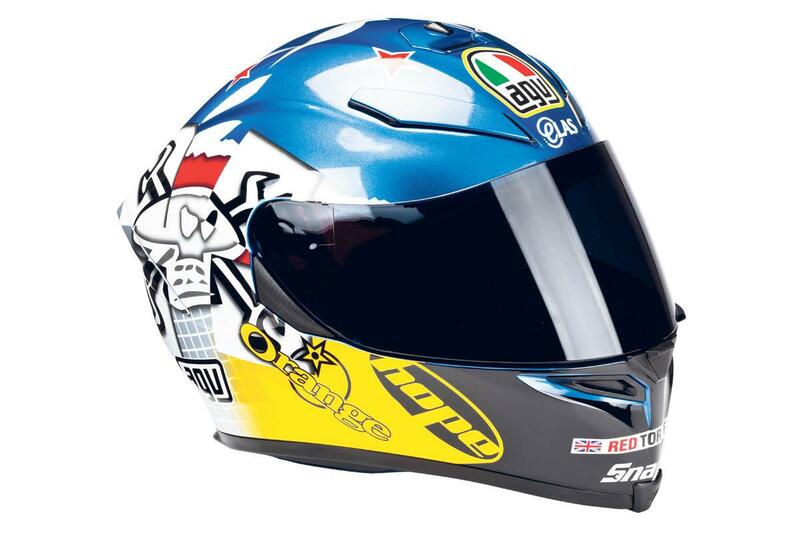 AGV’s K5 helmet has been around for a year now, but the replica of road racing and TV hero Guy Martin’s lid is all-new for 2016 and is revealed for the first time here in MCN. The design is effectively three replicas for the price of one and it’s called the 3Some as it combines three of the Lincolnshire racer’s favourite paintjobs. Martin’s helmet painter Paddy, from 3six2seven, worked with elements from the traditional yellow and black scheme then the blue and magenta one that was created for Guy’s ride on the legendary Britten race bike. The third section comes from the silver artwork used when he raced his home-brewed machine at the Pikes Peak hillclimb in the US for the TV show Speed. Martin wore the three-up design in races last year and a 3six2seven original was sent to AGV in Italy so this replica could be created. It includes all of Guy’s personal sponsors as AGV’s UK importer sought permission to use their logos to make the design as authentic as possible. The K5 is AGV’s base fibre-shelled helmet and the £250 pricetag keeps the helmet accessible to a wider section of Britain’s riders. They’re on sale in AGV dealers now.